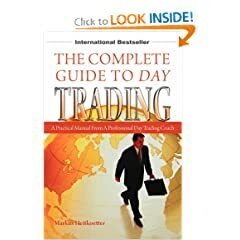 The Complete Guide To Day Trading is a Forex Market book written by a guy names Markus Heikoetter and is taken on a different perspective than many others take with their books and one that will help any Forex Trader who needs to know what he is doing right and wrong. Written from a traders perspective this book digs deep into the Forex Market the ins and out's and what to expect when you get into this type of business investing. Markus pulls no punches and tells it like it is even if that is not what you want to hear. His book though has several interesting things in it that will help you become successful in this type of a market. Everyday, millions and millions of dollars change hands giving the average person to profit from it if you know the right steps to take. Let us break down The Complete Guide To Day Trading so you can have a better grasp on how this book can help you and maybe put some money in your pocket as well. His book is basically a three-step approach that you see in many books on today's market. He walks you through from the basics to the actual process of making money on the markets with everything you need to do it properly and profit as well. Some of things that are covered in his book are the basics such as what you will need to get started. He goes over the tools, the methods, and the mindset you will need to profit with the Forex markets. He will also help you find the best markets to trade in. This is a section that many people leave out which is something that Markus covers well. He also shows you how to get started without risking a single penny. Yes without taking any of your own money, you can actually be making money on your own. He also shows you the seven most common mistakes people make. These mistakes can kill your profits and cost you a lot of money in the long run. Maybe one of the best parts of this book is the ready to use templates, charts, and resource directories that are included. Many people tend to forget that many new traders who come into Forex Trading really have no idea where to find this information so having those resources is something I wish more people would do. All in all the book is a well read and something to consider. My only real beef with it is it does not get deep into issues that many veteran Forex Traders may have. if you are just starting, out and need a guide than this will work for you.